The Canadian Toboggan is sure to be a big hit for the whole family! It is a great way to enjoy the outdoors during the winter and have hours of fun! It also makes a great gift for Christmas, birthdays and weddings! This toboggan is constructed in Canada with Northern Hardrock Maple for good looks and durability. The hood is secured with countersunk zinc plated screws for strength and easy repair. There is a yellow pull rope for convenience. The beautiful hood of the sled is maintained in a constant tension with the rope. 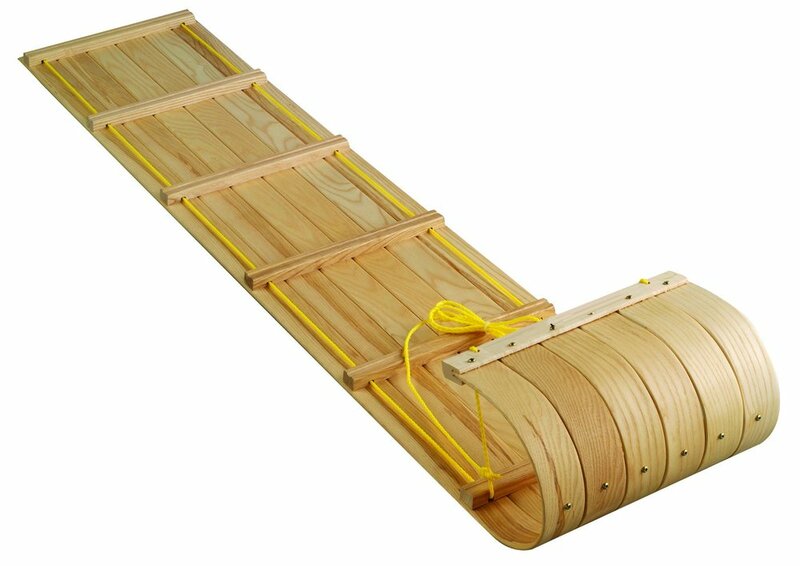 We recommend this sled for ages 5 years and up. Sure to be a big hit for the whole family or as a gift! Made with Northern Hardrock Maple. Hood is secured with strong countersunk zinc plated screws! Ages 5 years and up. Made in Canada. The Classic Toboggan is sure to be a big hit for the whole family! It is a great way to enjoy the outdoors during the winter and will provide hours of fun! It also makes a great gift for Christmas, birthdays and weddings! This toboggan is constructed in Canada with Northern Hardrock Maple for good looks and durability. Center and outside slats are stained in rich walnut. The hood is secured with countersunk zinc plated screws for strength and easy repair. There is a yellow pull rope for convenience. The beautiful hood of the sled is steam bent in a traditional shape and maintained in a constant tension with a chain. We recommend this sled for ages 5 years and up. Sure to be a big hit for the whole family! Made with Northern Hardrock Maple! Steam bent hood. Pull rope included. This nice red polyester pad is foam filled to cushion your sled ride. It can be secured to your toboggan with the attached ties. The polyester cover has the Flexible Flyer logo screen-printed on during the production process and the edges are sewn with black piping. We recommend it for ages 5 years and up.